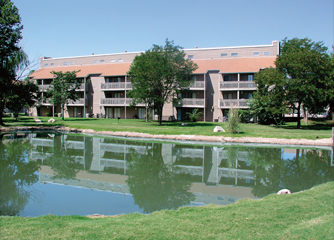 Enjoy Our Prime Arkansas River Location... in our LOVELY COMMUNITY! We offer a variety of floor plans to meet your needs... studio, one, two and three bedrooms featuring spectacular lofts and townhomes. Ideal Wichita location, close to schools, employers, restaurants, Super Wal-Mart & easy access to I-35 & 235. *Amenities Available in Select Apartments. Studio . . . . . . . . . . 520 sq. ft.
1 bedroom . . . . . . 630 sq. ft.
1 BR, loft . . . . . . . 827 sq. 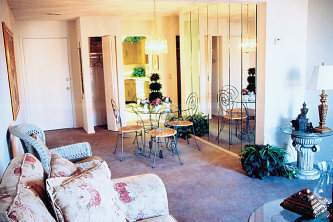 ft.
2 bedroom . . . . . . 858 sq. ft.
2 BR, loft . . . . . . 1,105 sq. ft.
3 BR, T.H. . . . . . 1,140 sq. ft.